Foxwell NT650 Automative Diagnostic Tool,Any Good? How to Fix Micropod2 Registration Error? Xprog/CarProg/UPA can program new keys to Ford? Here’s the working solution to wiTech Micropod 2 clone Chrysler diagnostic tool registration problem. Step3 Change the first number to any value marked red circle above. If witech still prompts error ” an internal registration error has occurred “, just ignore by clicking no icon to close it. Free download “Ford All In One 3.2” to work with Xprog, CarProg, UPA, etc for Ford key programming. How immobiliser works:Immobiliser data (PATS) on these cars are stored in the instrument cluster(IC) HC12 processor. If transponder key is stored in IC and synchronization data IC-ECU is correct, ECU permit to start the engine. data.Write this data to EH2 or TPX2 transponder with any transponder programmer (like RW4, Codereader or Zedbull). any programmer (like CarProg, XPROG OR UPA), save file and open it with “Open IC dump”. Open ECU(SID804,EDC16,SID206,SIM210) and read EEPROM (with CarProg you can read in-circuit). synchronization signal to motor ECU. If transponder key is stored in GEM and synchronization data GEM-ECU is correct, GEM permits to start the engine. 1. Remove GEM (Intelligent power distribution module) from car. 2. Open and locate 25320 EEPROM. Read (with CarProg you can read in-circuit). 3. Save file and open with “Open GEM EEPROM”. Program will show you transponder data. 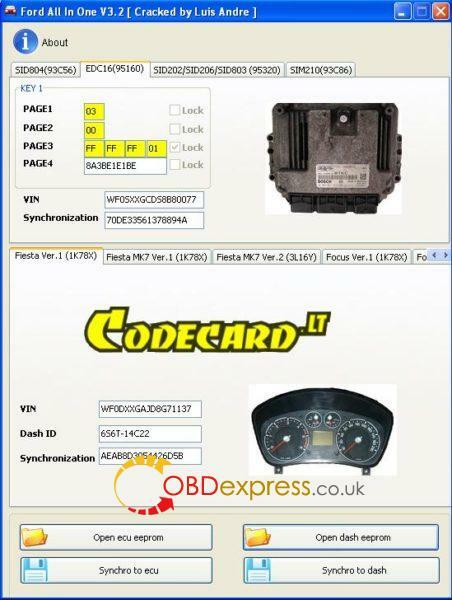 If motor ECU is defective/lost:. 1. Remove GEM (Intelligent power distribution module) from the car. 3. Save file and open with “Open GEM EEPROM”. 4. Open ECU and read EEPROM. 5. Open file with “Open ECU EEPROM” button. 6. Now transfer synchronization data from GEM to motor ECU using button Synchro to ecu. Important: The security is unknown! Tested only with some files found online. FOR SAKE OF SAFETY, PLS USE CARPROG WITH CARPROG SOFTWARE; XPROG PROGRAMMER WITH XPROG SW, UPA-USB WITH UPA SW.